This is the libertarian thesis differentiating them from liberals (and even many conservatives), who view greater government involvement in economic decision-making as the key to growth, equality and opportunity. From minimum-wage laws to higher progressive taxation to greater unionization to larger welfare programs to more regulations, liberals demand a stronger and more economically active central government. Libertarians, on the other hand, favor smaller government, less regulation, lower taxes, and greater individual and property rights. We’ve already clearly demonstrated via international and U.S. state migration rates that people the world over are naturally drawn towards greater economic freedom. Across countries, and even across states, millions of people every year migrate away from greater taxation and regulation and towards lower taxation and regulation. But are they better off? Let’s take a look at the 50 U.S. states, ranked by their level of economic freedom (a combination of free market ideals such as lower tax burden, greater property rights, less government spending, labor market freedom, and so on). Taking into account cost-of-living differences, the top 10 most economically free states have an average $52,334 median household income, which is considerably higher than the $43,090 median income for the 10 least free. That’s a 21% raise for workers by switching state government policies to a smaller government approach. How much more could it be increased if the same were done at the national level? The observed results are not a question of race or country of origin: African-Americans, Hispanics, Asians and immigrants also earn substantially more in the more economically free states. While liberals should be lauded for their apparent concern for the welfare of minorities, the truth is that their policies yield the worst results for them, a standard of living pay cut just for living in a more regulated and taxed state. One may think that this could be driven by urban vs. rural states more than policies, but the top 10 free states are 71% urban vs. 72% for the bottom 10–a negligible difference. Moreover, the states in between the two are even more urban, at 75%, which effectively rules out correlation. Another objection may be that “the rich” or “the 1%” are skewing the numbers–that income inequality is running rampant with less government to level the playing field, as many persistently believe. The exact opposite is the case. Using median incomes as the measure (instead of average incomes) effectively eliminates the impact of the very wealthy on the numbers. And the Poverty Measure is lower in the most free states (13.3%) than in the least free (15.1%). But the real measure of income inequality is the Gini index, and we can put aside for now the fact that median incomes are a far better measure of overall economic well-being than inequality of incomes (i.e. 100 people making $1 a day are perfectly equal but not better off than 99 people making $2 a day and 1 making $5 a day, despite the latter’s higher inequality). If we assume inequality to be an important economic measure instead of a normal byproduct of economic growth, the most free states do better, with a .446 Gini index vs. a higher and less equal .462 Gini for the least free states. Not only that, but the rate of growth of inequality over the past 40 years is lower in the most free states compared to the least free: 22% vs. 30%. In other words, heavier government involvement has led to more income inequality and faster growth of such, while less government has created a more equal growth in incomes. A final argument might be that while there may be greater income in more free market states, the increased government regulation and intervention provides greater care and increases the population’s happiness and well being. But the opposite is the case. Averaging each state’s Wellness rank for the past 7 years we find that states with greater economic freedom also bring greater happiness and well being. So what happens when you create a more libertarian environment where people make more money, have less poverty and find greater happiness in their lives? People want to move there. And indeed, looking at state-to-state migration of Americans between 2006 and 2010, we see a net migration flow of 704,000 from the 25 least economically free states to the 25 most economically free. That’s hundreds of thousands of Americans choosing to relocate away from greater government to more free market oriented government. On that latter point, it’s important to distinguish small-government libertarian from Republican. While it’s true that there’s a strong correlation between Republicans and economic freedom–the 10 most free states had a Partisan Voter Index (PVI) average of R+10.3 vs. D-6.1 for the 10 least free–it’s not a perfect correlation either. Two of the top 10 states (Virginia and New Hampshire), for instance, are swing states, and two of the bottom 10 economically free states (West Virginia and Mississippi) are solidly Republican. So there’s strong, but not perfect, correlation (hence the often uneasy political alliance of libertarians with Republicans). It’s also worth noting what economic freedom is not: it is not corporatism or crony capitalism, where the government bails out banks and subsidizes politically connected businesses, which both major political parties are heavily guilty of. Rather, it’s smaller, less intrusive government–one focused primarily on keeping the peace and staying as much as possible out of people’s personal and economic lives. Libertarians and liberals have almost diametrically opposed economic theories about what works best for the majority of people, and the reality on the ground is that it’s the libertarian free market policies that yield the better results: greater median incomes, a more equitable distribution, less poverty, greater success for minorities and immigrants, and higher overall levels of happiness and well being. In the political rhetoric landscape the battle of ideology is fierce and filled with demagoguery; in the real world the difference in results between competing economic policies are strikingly clear. The minimum wage is advocated as a well-intentioned means to increase the earnings of the poor, but a deeper look at the economics and demographics behind it indicate that such legislation isn’t necessarily the proper means to achieve those ends. Here’s why. As it is imagined, raising the minimum wage forces employers to pay all of their entry-level employees a higher wage than before, thereby raising their standard of living. This is true only if employers have no adverse reaction to changes in the cost of entry-level labor. Imagine for instance a government-mandated 20% increase in the minimum cost of magazine subscriptions. Should the magazine publisher automatically assume that not a single subscriber will unsubscribe after such a rate hike? Or that they will sign new subscribers at exactly the same rate as before? What if it’s a 50% rate increase? It’s an economics concept that everyone understands: as the cost of something increases, demand correspondingly decreases. The extent by which demand is affected by changes in price is called price elasticity. For some things, the price elasticity is very sensitive: a small change in price will have a major impact on demand (e.g. a 20% increase in magazine subscription cost might cause 50% of subscribers to cancel their subscription). For other things, there is less price elasticity (e.g. a 20% increase in subscription cost might only cause 2% of subscribers to cancel). But absolutely anything that has a price has some price elasticity, without exception. Including the price of entry-level labor. 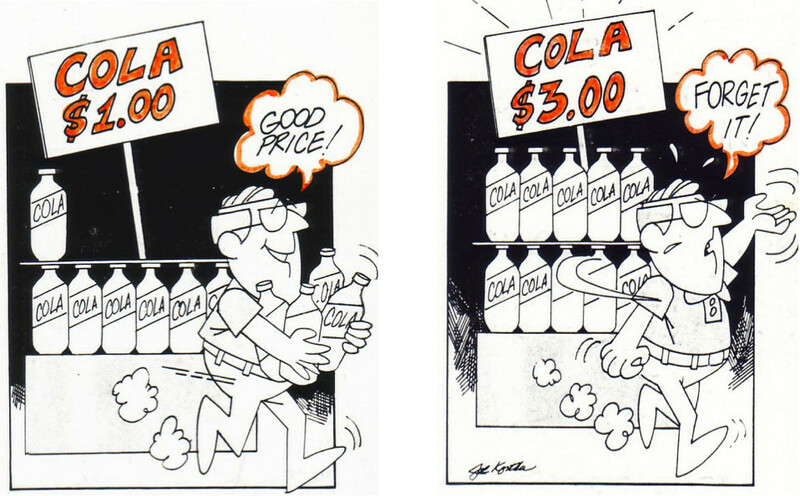 Employers, like consumers, respond to prices. As the cost of entry-level labor increases, some employers will continue to pay for that same labor at the higher wages, but some will not, either reducing hours, cutting jobs, changing the way they do business or forced out of business. And of course the greater the increase in labor costs, the greater the impact on employment: a $0.01 increase in the minimum wage will have very little impact, whereas a $10 increase would likely lead to significant layoffs and bankruptcies. So the first question anyone should ask about any proposed hike in the minimum wage: how much will it increase unemployment? To claim that it will have no impact on net employment would mean that wages could be increased to any hourly rate without ever causing a drop in demand for that labor. In other words, someone claiming that there is no price elasticity to entry-level labor is arguing that raising the minimum wage to $20 or $50 or $100 per hour would have zero impact on employment, which is not credible. Minimum wage laws above market rates are not about if they increase unemployment, but by how much they do so. The government well understands this tradeoff as well. For instance, the Congressional Budget Office recently estimated that the latest proposal to raise the minimum wage from $7.25 to $10.10 per hour would cause 500,000 current minimum wage workers to lose their jobs. A worthwhile price to pay for those that will now earn more? Perhaps, although there is a questionable morality to intentionally robbing the worst off of their income and livelihood in order to benefit others. 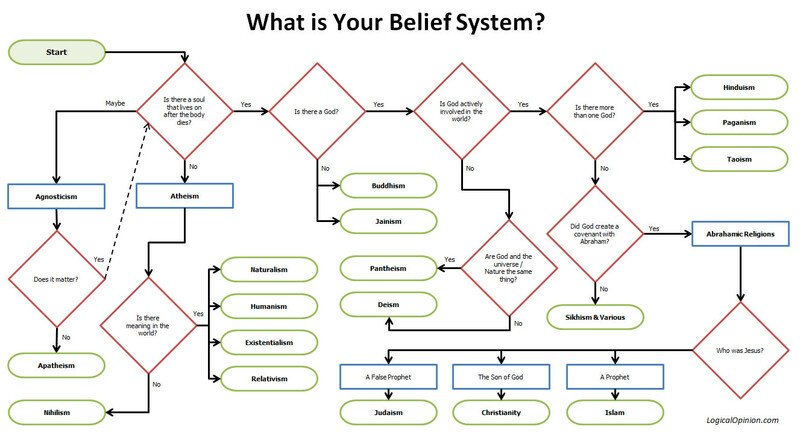 It’s easy to play God with abstractions, but what if it were your job being sacrificed? When it comes to where the money will come from to pay higher minimum wages, it is typically assumed by its proponents that businesses will simply reduce their profits a little to pay the workers more. The reality, however, is that the vast majority of businesses–and especially those that rely on minimum wage labor–run on thin margins. The average profit margin for all businesses is around 8% and small businesses–those that fuel job and economic growth–typically fall under that. According to the Bureau of Labor Statistics, half of all minimum wage jobs are in the restaurant industry, which has an average profit margins of 2 – 6 percent. Not oil or drug companies or Wall Street banks, who have essentially zero use for entry-level wage workers. Labor makes up a disproportionate amount of a restaurant’s costs, with non-managerial labor typically in the 20 – 25% of revenue range. The math is simple: if you were to force restaurant wages up by 20%, that would add 4 – 5% in total costs and completely wipe out the average restaurant’s profit margin. The only way for most restaurants to stay in business would be to raise their prices. Assuming they stay in business after doing so, it’s inescapable that they’re not the ones paying for the wage hikes–the customers are. In the vast majority of cases, a hike in the minimum wage is not a transfer of additional money from businesses to employees, as its proponents imagine, but a transfer of money from customers to employees. And the latter is not necessarily the more disadvantaged group. One of the biggest misconceptions is that minimum wage earners represents “the poor.” There’s actually very little overlap between the two. According to the Bureau of Labor Statistics, 2.28% of American workers earn the minimum wage. Of those, half (48%) are under 25, and these 16 – 24 year-olds live in households with an average family income of $66,000. That’s nearly double the national median household income and three times the national poverty line. These minimum wage earners aren’t anywhere near poor–they’re middle class teenagers, college students and young adults just starting out in the job market. And what of minimum wage earners over 25? Their ranks dwindle very quickly as they age (over 70% of minimum wage earners are under 35), and their average household income is $42,500 a year, well over the national median and nearly double the poverty threshold. Half of them are working part-time, and two-thirds are white, mirroring national demographics. In other words, the typical profile of minimum wage workers over 25 is of second earners in mostly young, middle class households. 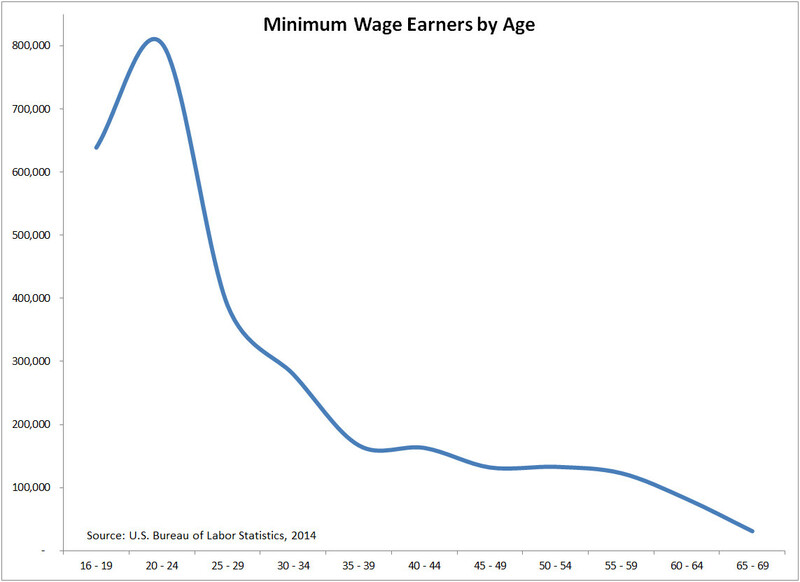 Are there any 25+ year-old minimum wage earners living below the poverty line? Yes, about a quarter of them are–roughly 13% of all minimum wage earners. 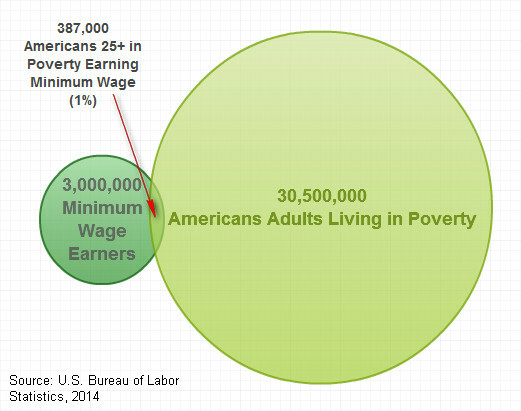 That’s about 387,000 workers, or 1.3% of the 30 million American adults stated to be living in poverty. That makes for next to zero overlap between minimum wage earners and the poor. In fact, the biggest problem for the poor isn’t their wage level but lack of jobs: 67% did not work during the past year. And of those that worked, 3/4 didn’t have a full-time job. The poor need a larger supply of available jobs, not less. Minimum wage jobs are primarily a stepping stone to better employment opportunities for the young, or a part-time work opportunity for second income earners. These types of jobs are not meant to be a career nor the primary means to earn a living. These jobs are also not the home of the nation’s poor, 98.7% of whom aren’t minimum wage earners. More importantly, entry-level jobs are the entry point into the job market for teenagers with as of yet no marketable skills or job experience, a gateway to better opportunities. Most top income earners once started with such employment back in their teens. The higher the first rung of the employment ladder, the more out of reach it becomes for many, robbing youths and new members of the labor force (e.g. financially disadvantaged immigrants) of valuable job training and experience. And what happens to teens and young adults with no money or viable job prospects? Priced out of employment by minimum wage laws, they’re faced with a choice between poverty, black market labor (with no employment protections), or crime. In other words, minimum wage laws aimed at helping the poor are in fact likely to be inadvertently contributing to their perpetual disadvantage, locking inexperienced teens and young adults out of a viable entry point into the legal job market where their skills–and income–could grow over time. Instead of a path to prosperity, this creates a systemic, perpetual cycle of poverty and crime. The impulse to do something to help the poor is right and noble, but on that front good results count far more than good intentions. If the goal is to provide the actual poor with more direct income, a tax credit (such as the EITC) is by far the simplest and most direct means to do so, targeting the exact income ranges and family situations to provide taxpayer-funded assistance to those who actually need it. Trying to artificially do so via a legislated minimum wage, which affects just 1% of the country’s working poor and whose benefits–to the extent there are any–fall mainly to teenagers in wealthy families, is both ineffective and likely counterproductive. 2) Why is it morally right to eliminate the livelihood of some so that others may financially gain? 3) What does the additional unemployment do to the long-term health of the overall economy? 4) Why is a forced raise that primarily benefits teens and young adults from wealthy families better than the same money given directly to people who actually need it? Are there possible answers to all of these questions? Sure. Minimum wage policy is one of the most fiercely debated topics in economics, with highly respected economists, research and empirical evidence on both sides. One need look no further than the hundreds of economists openly against or in favor of minimum wage laws, each with Nobel Laureates. But one thing is clear: it’s a topic–and legislation–that warrants a lot more intelligent thought and respectful consideration than most of its advocates give it. On both sides. Do Americans prefer to live in Democrat or Republican states? As discussed previously, on the international level the data is clear: millions of people every year vote with their feet and move from countries that are less economically free to countries that are more free-market orientated. People of every nationality and culture generally favor economic freedom over central planning. But what of within the United States? 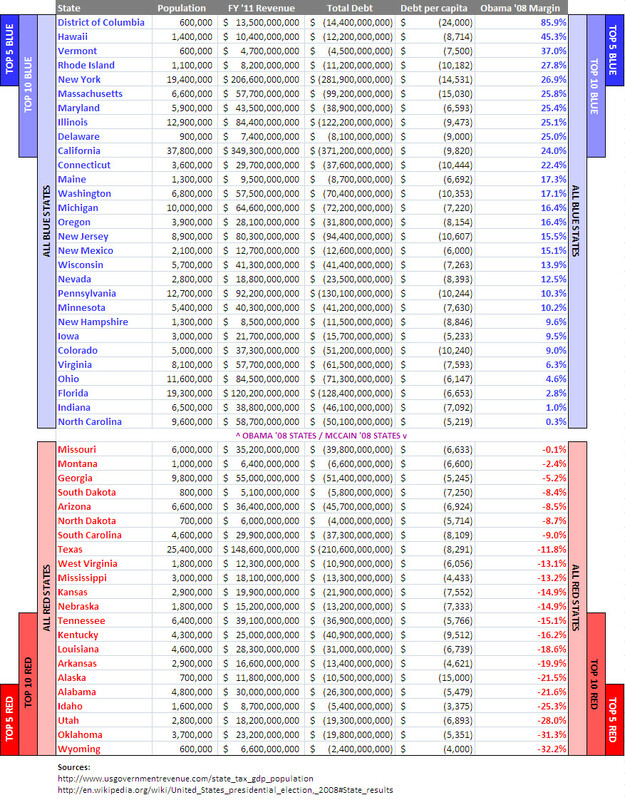 A very similar analysis can be done by ranking each state according to the Cook Partisan Voting Index (PVI) and correlating that with IRS state migration statistics. 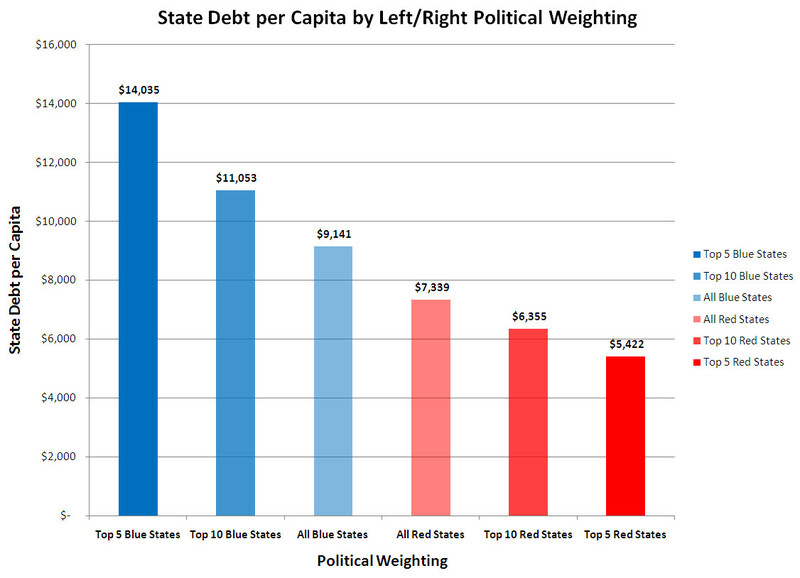 A state’s PVI measures how strongly each state favors one political party over another. For instance, the state of Massachusetts has a PVI rating of D+12, which means that a generic Democratic candidate up for election would be expected to receive 12% more votes than the national average. 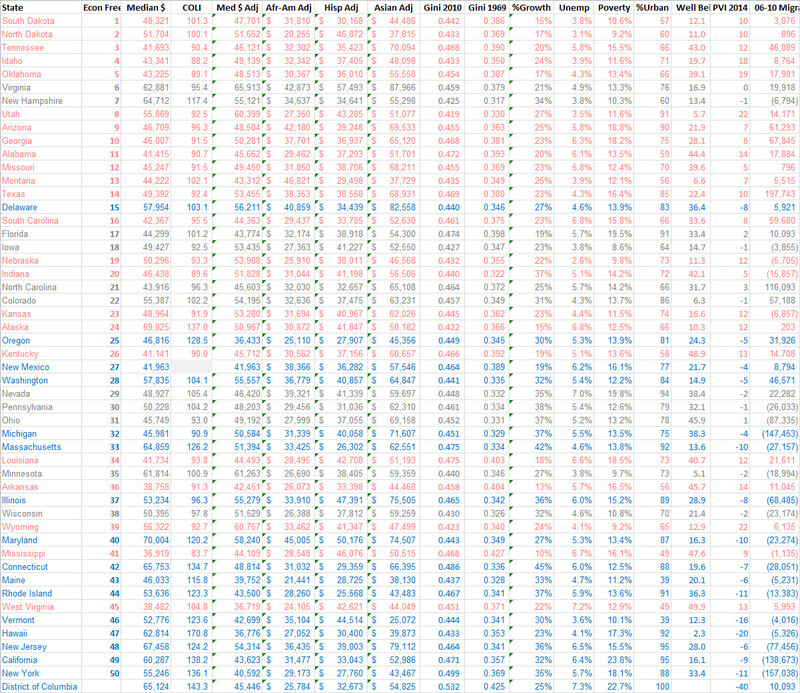 Conversely, Texas has PVI rating of R+10, which means that it votes 10% more Republican than the national average. And a state like Colorado is at a zero PVI, a true swing state with neutral partisanship. Ranking each state by its PVI, we get a full range of states from the most conservative (Utah) to the most liberal (Vermont). So how do we measure which states Americans prefer to live in? The IRS publishes migration data every year. Since tax returns are filed by Social Security Number, the IRS can track how many filers and dependents each year file from a different state than the one they were in previously. Since this excludes births, deaths, and foreign migration, this is an exact measure of the number of Americans making a conscious decision to move from one state to another. 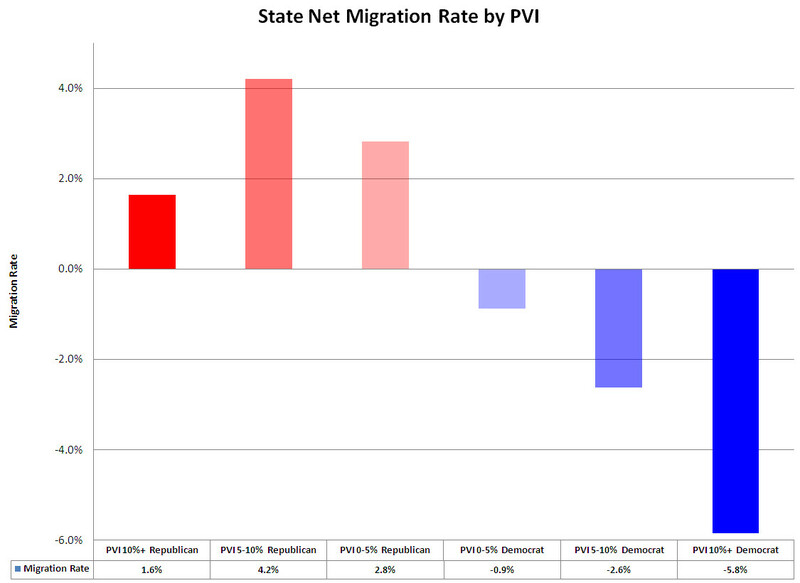 The higher the Democrat PVI, the higher the percentage of people left the state to move to a Republican-leaning state. States with a Democrat PVI of 10% or greater over the past decade saw an average outflow of 5.8% of their population to other states. States with a milder Democrat PVI of between 5 – 10% also saw outflows, albeit at a lower average level of 2.6%. And states with a light Democrat lean with PVIs of up to 5% saw small population outflows of 0.9%. Conversely, the people moving out of Democrat states are moving into Republican states. Those with a center-right lean with Republican PVI of up to 5% saw net inflows of people moving from Democrat states of 2.8%. And even more Americans chose to relocate to states with a Republican PVI of 5 – 10%, with a strong 4.2% net population inflow. Interestingly, the trend weakens with states with a very strong Republican lean (PVI of 10% or more), which weren’t as popular as center-right states but still saw net population inflows of 1.6%. What do the figures tell us? On average, the migration trends at the U.S. state level mirror those at the global level: hundreds of thousands of Americans every year vote with their feet and make the choice to pack up and move away from Democrat states and into Republican ones. The more Democrat-leaning the state, the faster they move away. And on average, the preferred states to move into are center-right Republican states. Whether that’s good policy or not, there’s a huge difference between the class warfare rhetoric and the economic reality of the proposals, a combination of economic ignorance by many who support such a tax increase and the politicians willing to deceive them in order to actually increase taxes on the middle class. As this annotated chart from the Wall Street Journal shows, there’s not all that much money above the $1 million mark, and much of it is already heavily taxed. You could in fact confiscate 100% of the income of all millionaires and above this year and at $938 billion it would hardly make a dent in the national debt. No, the real money in this country is in the middle, and that’s precisely what the proposed tax on “millionaires and billionaires” is intended to target. But how? Even at a threshold of $200,000 for individuals and $250,000 for couples, it would appear that the tax would only impact the upper range of the income distribution, not the bulk of the middle class. And therein lies the dirty trick: wage inflation. Every year, average incomes rises from a combination of monetary inflation (historically 3.25% a year) and wage inflation resulting from gains in real productivity (long-term average of 0.65% annually). And tax brackets are not indexed to account for either of these. Average incomes rise by an average of 3.9% every single year, and tax brackets stay the same. Which means that every year, more and more people move up into a higher tax bracket (known in economics as “bracket creep”). Or, if you look at it in today’s dollars, what actually happens is that the tax bracket moves relatively lower by 3.9% every year (this is probably on the low end, as recent monetary policy has been expansive, which could easily push inflation to 5% annually or higher which would yield 5.65% annual wage inflation). 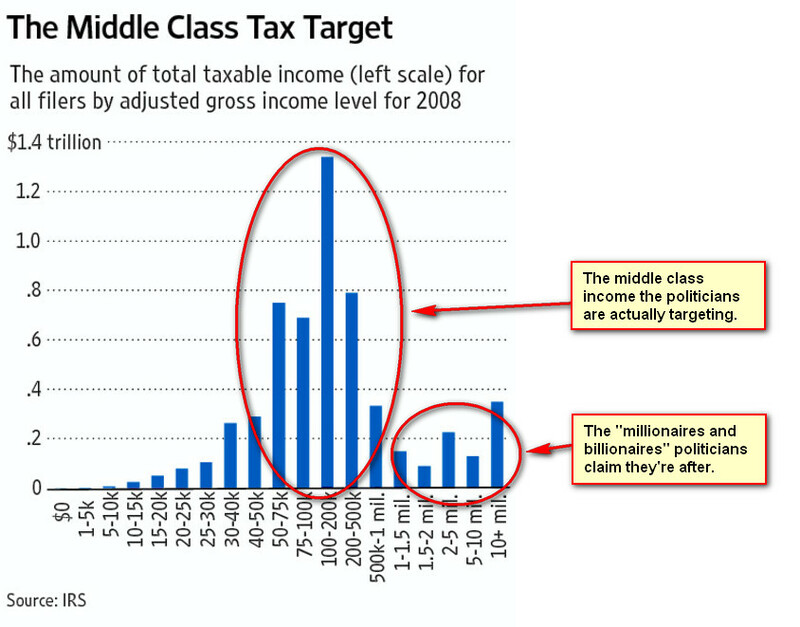 As you can see, the “millionaire” tax starts off targeting households with $250,000 in combined income or more, but even in a low inflationary environment starts hitting the upper middle class after 10 years. 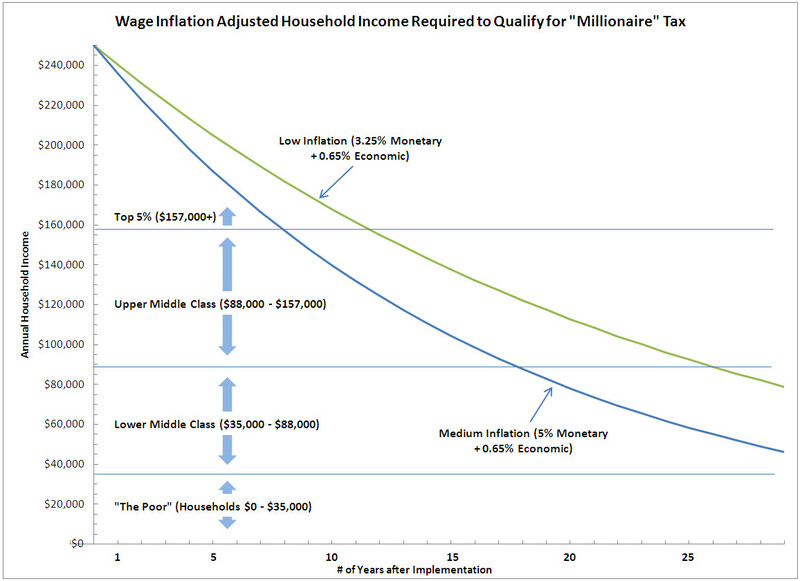 After 25 – 30 years, all but the poorest households are in the “millionaire” tax bracket. Within 25 years, even if inflation stays under 5%, a married couple earning $29,000 a year each (i.e. combined household income of $58,000) would be in a tax bracket currently being touted as a tax on “millionaires and billionaires.” This is not an accident or oversight on the part of the politicians designing these taxes: their own projections show progressively higher tax revenues each year, not because they think there will be more millionaires but precisely because they know bracket creep will capture more and more of the middle class as inflation pushes them into the higher brackets. But as you sow, so shall you reap. Some politicians claim that they’re not going to raise your taxes; instead, they say, they’re going to raise taxes on corporations. Those nameless, faceless, greedy corporations will shoulder more of the tax burden instead of Joe American. Here’s the reality: corporations do not pay taxes. Corporations collect taxes. People pay taxes. Corporations may be legal entities, but money always comes from someone. Real people. And when it comes to corporate taxes, that someone is either consumers, employees or investors. 1) By increasing the price of the product or service. Corporate tax is passed on to consumers as a hidden sales tax. 2) By reducing employee wages and benefits. Corporate tax is passed on to employees as a hidden income tax. 3) By lowering returns to investors. Corporate tax is passed on to investors as a hidden capital gains tax. This drives down the value of the stock market and lowers the rate of new investments and job creation. That’s it. Those are the only three ways in which a corporation can “pay” taxes, and they all come from actual people’s pocketbooks. People like you and I. There’s no other choice. Because corporations do not ultimately pay taxes: people do. – Do you buy products or services from businesses? – Do you work for a business? – Do you own mutual funds, stocks or bonds? If you answered “yes” to any of the above, that means your taxes are going up if corporate taxes are increased. Period. Be it via a hidden sales tax, a hidden income tax or a hidden capital gains tax, your taxes are effectively going up. So the next time someone tells you that they’re not going to raise your taxes, but that corporations will foot the bill instead, the only question you should be asking yourself is whether they’re economically illiterate or trying to fool you. And wonder which is worse.